Le Tour de France and La Vuelta - Timeline Television Ltd.
Timeline Television provides VSquared TV with tight-turnaround editing and live broadcasting services for two of the cycling calendar’s biggest events – Le Tour de France and La Vuelta a España. A major change in the production requirements was marked in 2014, as both events moved over to Final Cut Pro X as the editing platform of choice. With support from industry partners, Timeline Television hosted the world’s first live programme featuring VTs created in FCP X and a same-day highlights package also made using Apple’s latest video editor, for broadcast on ITV4. In 2015 the company has refined and enhanced the FCP X workflow, using the latest software releases and accumulated engineering knowledge to provide a smoother and more refined production experience. During Le Tour, footage is received via Timeline’s satellite downlink from France and streamed onto shared storage using Softron’s MovieRecorder software. Running on a Mac Pro with multichannel video I/O capabilities, multiple streams can be captured simultaneously. MovieRecorder is tailored for edit-during-ingest on FCP X and the result is instant access to footage as it is captured with no delay between receipt of frames and what the editors can see in the suites. Structured media and library management enables a collaborative workflow between four suites, and finished VTs and highlights packages are sent to an EVS XT3 for play-out live on air. Both programmes are transmitted from Timeline’s production gallery to ITV over fibre with a separate satellite uplink providing a diverse transmission path. Presentation links from a dedicated OB truck in France are cut with live pictures from the host broadcaster to produce an engaging live transmission, while the evening highlights make use of the OB to provide pre-recorded links and studio chat. 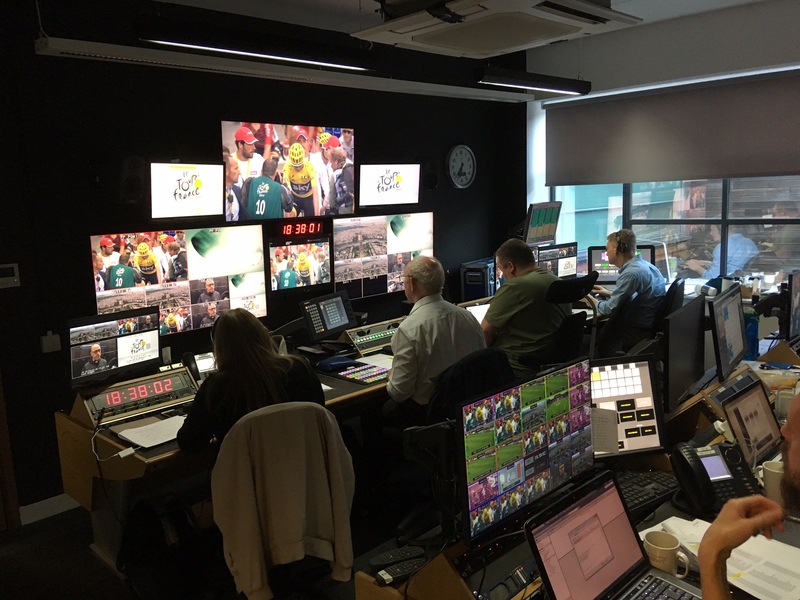 For La Vuelta, the live requirements are supplanted with the need for a studio and commentators on-site, resulting in a truly complete production in-house at Ealing Studios. Sony 2500 cameras capture the scene in our purpose-built studio within the production complex. Audio for presenter and guests is mixed in the gallery and live-cut on the mixer, allowing pre-recorded output to be streamed directly to the edits and inserted into the final package. Commentary is inserted into the incoming feed from Spain and mixed at the point of ingest. As before, the show is broadcast from an EVS XT3 with live ingest taking place as the programme goes to air. 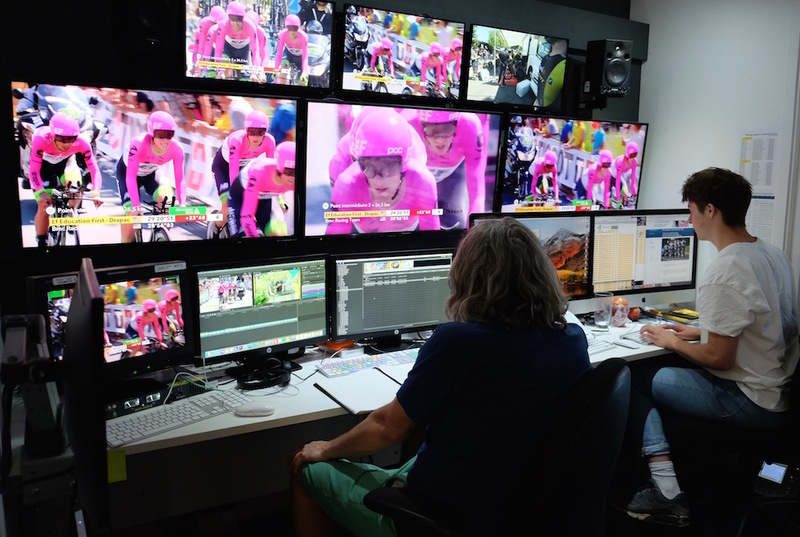 Encompassing 42 stages of world-class cycling, and by producing 44 highlights packages and 21 live shows each summer, the cycling season at Timeline Television truly is a Grand Tour de Force.